OVER the course of four years, Nolan Tokuda figured out ways to get the most out of Leilehua's best quarterback in a quarter-century. Tokuda moved up from the junior varsity as coach at the same time Bryant Moniz took the spotlight as a sophomore starter. The gifted passer guided the Mules to the state tournament final in 2005, sustained a season-ending collarbone injury as a junior, and was a first-team selection to the Star-Bulletin All-State team last season. Moniz threw for more than 1,000 yards with 12 touchdowns and only four interceptions in Oahu Interscholastic Association Red West play. With complete mastery of a hybrid offense, Moniz led Leilehua to 337 total yards per game to lead the Red West. With Moniz, who is at Fresno City Community College now, the Mules went 7-4 and barely missed a state-tournament berth. A 23-21 loss to Mililani ended Leilehua's season. With Moniz among seven offensive starters gone, the Mules may seem to be due for a down year. "That's a question right there. He was a guy we could count on for three years," Tokuda said. "But we've answered the question." Coaches and media seem to agree. They voted Leilehua No. 8 in the Star-Bulletin Football Preseason Top 10 this week. In addition to a senior-heavy defense, an influx of two-time OIA junior varsity champion players have moved up to the varsity. "Looking at spring, this team played together as one, winning together. At the JV level, we didn't have a guy like Bryant. We're gonna play together. They know they don't have a superstar name, so they're playing as a team, picking each other up. We haven't had to say anything. That's how their response is," Tokuda said. 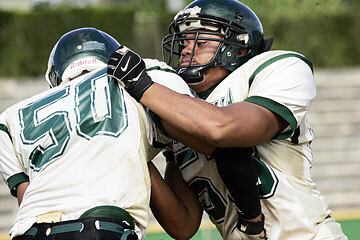 Leilehua has led the Red West in defense for two seasons in a row. Last year, the Mules permitted only 221 yards per game, including less than 100 per game through the air. "Defense is our strength. We'll stay in our 4-3," Tokuda said. One of the notable additions is defensive tackle Dante Scott, who started as a sophomore two years ago. The 6-foot-3, 270-pound senior sat out last season, but is drawing attention from college recruiters since returning to the gridiron. Returning starters include 6-foot, 240-pound nose guard Kalu Delos Santos and outside linebackers Art Laurel (6-1, 205) and Robert Siavii (6-1, 200). The secondary is also laden with experience. Aaremy Palomares, Micah Cruz and Peter DeSaulniers are returning starters. When Leilehua has the ball, creativity will still be a strength. Tokuda and his staff implemented more running formations in the past two years, and that tendency won't change. Junior Kaipo Kea has won the starting job at quarterback, but senior Kaipo DeRego will see a significant number of snaps. "(Kea) had a really nice spring game," Tokuda said. "It's similar to how Florida used Tim Tebow. That's what we can do with Kaipo DeRego in there." Both Kaipos will have a good level of comfort in the pocket, thanks to the return of three starters on the O-line -- Jordan Jenks, Sanford Salavea and Chris Atualevao. "We've added more of a run emphasis in our playbook. Bryant could throw 30 or 40 times a game, but now we have guys who can throw 20 or 30 times and run 10 or 15 times," said Tokuda, who has borrowed concepts from many teams, including Florida State, UH and the San Francisco 49ers in the past. Above the personnel and experience aspects, Tokuda has been gratified by leadership on his squad. "They're very accountable. Practice is at 3, and the kids are on the field at 2:55. Our kids have put a lot of work in since January. We tell them you reap what you sow," he said. Win or lose, rain or sunshine, the Mules haven't lost their edge. They'll need to stay healthy in an unpredictable, deep Red West. "The attention, it's good, but it doesn't mean anything. Any Friday or Saturday night, anybody can beat anybody," Tokuda said. "That's the beauty of parity."